The Kampala Evangelical School of Theology (KEST) has had a history of challenges, from accreditation issues to lack of resources. At the same time, miracles abounded through the years. And what may have seemed impossible to some resulted in a triumphant milestone for God’s Kingdom in Uganda. This past May, the school celebrated its first class of graduates since its inception in 1989. John Stott Ministries had its own kind of celebration; behind the scenes, the three JSM-Langham programs – Literature, Preaching, and Scholars – came together in strategic support of KEST. The Langham Scholars program through the years has sponsored two scholars, David Zac Niringiye and Philip Wandawa, both key players in the development of KEST. The Langham Literature and Preaching programs worked to host preaching conferences at KEST and distribute much-needed training and theological texts to local participants. Nothing confirms more the efforts of JSM-Langham than acting as a strategic catalyst for church leaders and witnessing as their vision for the church in their region becomes real. 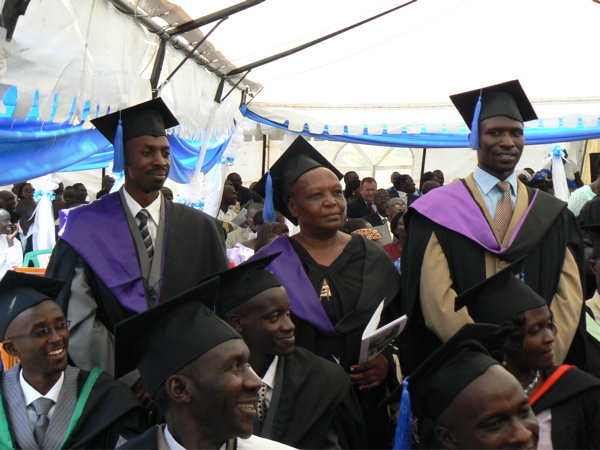 Read Mark’s blog entry and see more pictures of the KEST graduation. Learn more about the JSM-Langham programs.